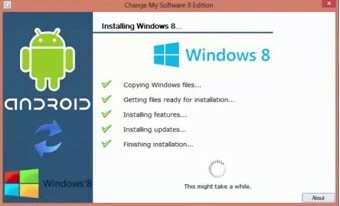 Hello everyone,today we are going to show you how to install window on your android tablet or Phone. I tried a lot of method for this but i am going to show you which is easiest-one. All you have to do is simply follow the steps. Make sure your tablet config is compatible enough for dual booting and running windows 8 we will talk about this later-on. Step 1:- Now before we start i would like to tell you about “change my software”. This is a third party software which offer you change your OS, but there is condition it work on only Android to Window and vice-versa. This software is available in various edition 10, edition 8, edition 8.1. It depends on you which window you want to install on your android tablet. You can download this software from google or torrent. 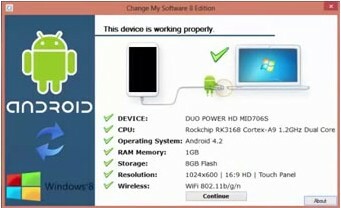 Once you install this software you need to connect you tablet with you PC through USB cable. 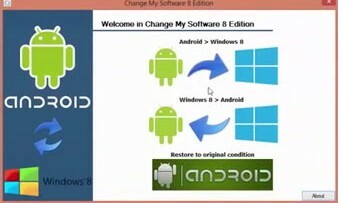 Now as you can see in this image that there is two option, First is Android to Window and other is Window to Android. Now we choose Android to Window and click on next. Step 2:- Proceed further by tapping on Continue and than software check that your device is working properly and tell you some tablet. latest version of this software will show you a extra dialog box of backup it’s better to take backup of the tablet. Step 3:- Now select language form the drop-down menu. As soon you select your language the window driver will start download form internet. Now wait until it complete it depends on your internet connection. Step 4:- When downloading complete click on the “Install” button. Here the Most important part if you want to keep your android OS then do not click on “Remove Android” check button or if you want to remove your android than click on check button. Click on Install button and wait for sometime to get install all settings and feature of windows on your android tablet. Step 5:- Now after completion of the process restart you tablet. 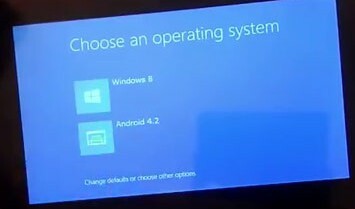 When you reboot your tablet you see two operating system in you tablet. 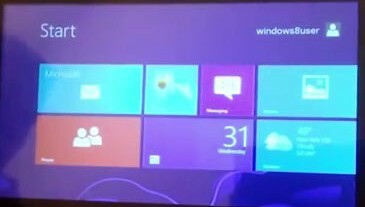 Step 6:- Now choose window 8 operating system and wait until window load. So here you go now you can enjoy both Android and Windows on your tablet. That’s all friend, if you face any kind of problem or query regarding install of windows on android tablet feel free to ask through comment.